Surrounded by the bright blues of the Adriatic, beyond which you can see the pale, bare cliffs of the mainland, Pag Island is magically barren and beautiful at the same time. This moonscape dotted with sepia coloured villages is home to some of Croatia’s most unexpectedly good wine - considering the soil is so sparse - and the salty cheese the island is probably best known for. It’s not all ancient rural life though, there’s also a club-y town, Zrce Beach where all the clubs and bars are right on the beach. If you’re here to party then this is one of the best places to stay on Pag Island, but if you’re here to soak up the island’s beauty then you’ll probably want to base yourself in Pag Town. Kick back and relax on one of Pag Island's numerous beaches, ideal for enjoying the sun or paddling in the warm blue waters. Alternatively, for the thrill seekers there's the option of watersports to keep you entertained. Or for something a bit different, stroll around the Olive Gardens of Lun with majestic old trees making the place rather tranquil. Check out some of the island's most impressive architecture at the Church of the Assumption situated in the main square. Our pick of the best places to stay in Pag Island allow visitors to really unwind and soak up the local culture. 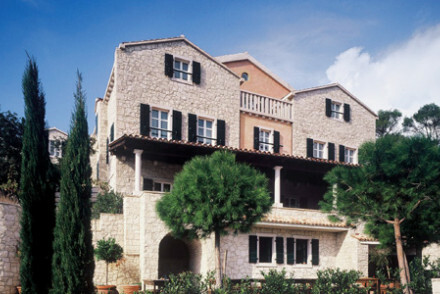 The Hotel Boskinac is a stunning, 11 room, stone house with wonderful balconies and views and a gourmet seafood restaurant. Extremely romantic, and with its own wine cellars and tasting rooms. If you'd prefer a self-catering option, visit our online partner, Booking.com for a charming selection of coastal properties ideal for making the most of the beaches. Fly to Zadar Airport located 81km (50 miles) from Pag with a wide selection of services across Europe. It's then possible to transfer via bus to Pag from Zadar. Alternatively, catch a ferry to Pag Island with daily sailings to Rijeka. If you want to rent a car to explore the rugged landscape of the island - click here for prices and booking with our online partner, Rental Cars. Best time to visit - the summer from June to August for hot temperatures, ideal for unwinding on the beaches. A stunning country house on the beautiful island of Pag. A stone walled house with wonderful balconies and views, a gourmet seafood restaurant, wine cellar, and charming rooms and suites. Very romantic, gourmet, and perfect for exploring the delights of the island. Ideal for couples or weddings. Foodies - Gourmet restaurant serves innovative modern seafood dishes. Wine tasting - The hotel has its own wine cellars and wine tasting area. Charming - An absolutely charming country house in a rural setting. On an island - Pag is a beautiful island ideal for exploring.